Dubai Properties will start handing over Phase Two of Mudon in Dubai, UAE, which includes 700 three- and four-bedroom villas. The handover will continue through 2016. The developer has already handed over Phase One of the project that comprises 390 villas. Located in Dubailand, Mudon is a family-oriented self-contained community with its own shopping centre, schools, nursery, health club, mosque, parks, jogging and cycling tracks, kids’ zones and football and basketball courts. This 30-million-sq-ft residential development will be home to over 4,000 people with villas and townhouses. A 64,000-sq-ft community centre is also ready. The project will also include a Mudon Central Park and a Gems school, which is slated to open in September 2016. 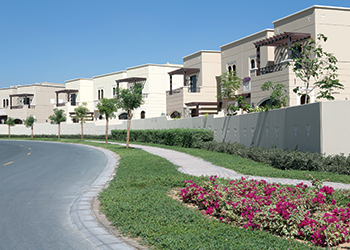 Dubai Properties launched Phase Three of Mudon, which will have 700 townhouses, last May. For this phase, the developer opted for smaller unit sizes compared with the first two phases. Construction of this phase has commenced and is expected to be completed in 2018. UAE-based master developer Nakheel has more than doubled the number of parking bays at its Dragon Mart retail complex in Dubai with the opening of a new multi-storey and roof car park that accommodates 4,500 vehicles. Located at Nakheel’s newly-opened, 1.9-million-sq-ft extension to the original Dragon Mart, the new spaces bring the total number of bays at the retail hub to over 8,200. Parking is free of charge. Dragon Mart Two boasts more than 500 new shops, restaurants and entertainment outlets, adding to the 3,500 stores and kiosks across the road at the renowned retail destination. Among them is a 100,000-sq-ft Geant hypermarket, which opened last year and a 12-screen Novo Cinema complex, opening soon. There is also a food court and a separate dining terrace offering a range of indoor and outdoor eating venues. Omar Khoory, director of Nakheel Retail, points out that Dragon Mart was already welcoming 65,000 people on a daily basis and 80,000 during its busiest periods. “Dragon Mart Two will bring even more shoppers and traders to this expanding retail hub. We are expecting over 100,000 daily visitors as the extension gathers momentum and word spreads about our exciting new destination,” he says. Dragon Mart One and Two are just a couple of minutes’ walk from each other, allowing shoppers to use either the new or original, 3,700-space car park to visit both malls. The complexes are separated by Dragon Drive, a tree-lined boulevard where a number of new attractions and cafés are planned. Manara, a leading real estate development company, has confirmed its strategic sponsorship for the Gulf Property Show, being organised by Hilal Conferences and Exhibitions (HCE) from April 26 to 28 at the Bahrain International Exhibition and Convention Centre in Bahrain. The event will see top exhibitors showcasing their commercial and residential real estate developments from Bahrain, GCC, Turkey, US, UK, and Europe to a targeted audience of investors, says HCE. Manara Developments’ current projects include a portfolio of affordable and luxury residential projects in addition to commercial and light industrial developments. A joint venture between Al Salam Bank Bahrain and strategic partners, Manara Developments was set up in 2006 to develop real estate projects initially in Bahrain but with the aim of expanding to cover a wider market across the Gulf region. Its key projects include Tubli Gardens, Nurana, Wahat Al Muharraq, Investment Gateway – Bahrain and Kenaz Al Bahrain. Gulf Property Show takes place alongside two other major exhibitions – gulfBID and gulf Interiors. Diyar Al Muharraq, one of the leading urban developers in Bahrain, has already signed up as a strategic sponsor for Gulf Property Show 2016.